Held under the patronage of HH Sheikh Mansour Bin Zayed Al Nahyan Deputy Prime Minister of the UAE, Minister of Presidential Affairs and Chairman of Abu Dhabi Food Control Authority, SIAL Middle East 2016, the region’s fastest-growing professional trade exhibition for the food, beverage and hospitality industries, returns to Abu Dhabi National Exhibition Centre (ADNEC) from 5-7 December 2016. Global food innovation, food security and the latest industry trends will headline the calendar of events at the 7th edition of SIAL Middle East, which will welcome back a number of popular show floor events and introduce several exciting new initiatives that will address key industry issues facing the region and the food sector in general. This year’s three-day industry showcase will bring together regional experts, thought leaders and decision makers for an all-new series of niche conference sessions covering a wealth of high profile topics including organic foods, own label opportunities, food fraud, city farms, GM food issues, halal, food security concerns and wastage. “Food imports into the Middle East are expected to reach US$35.2 billion by 2020 according to a report from BMI, and the F&B sector is vitally important to the region on many fronts. 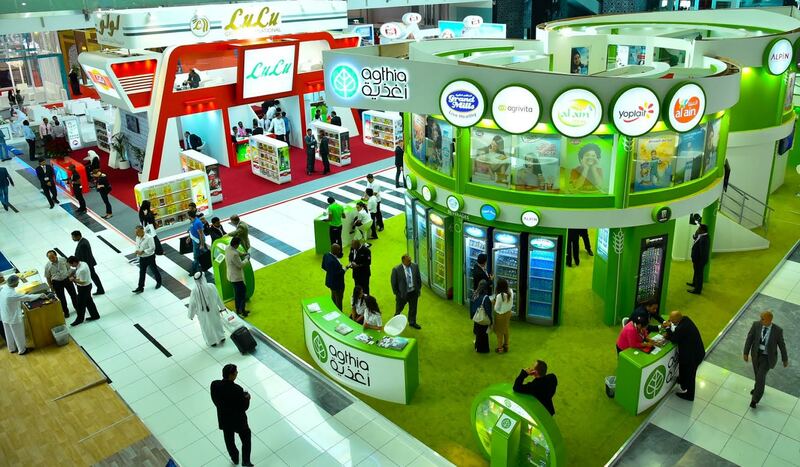 Not only do we depend on imported goods on a daily basis but, as consumer tastes and awareness develop, we are seeing a shift in product demand and expectations,” said to Thamer Al Qasemi, chairman of the organizing committee of SIAL Middle East 2016. “Last year saw record numbers visiting show, this year some 22,000 senior decision makers from major food companies, representatives from F&B outlets and hotels, food retailers, Government officials, distributers, importers and exporters exhibitors, and hosted VIP buyers are expected to attend the event” he added. “In 2015 we welcomed in excess of 926 innovative exhibitors and more than 15,000 passionate trade professionals for three days of business, networking and knowledge sharing. We are confident that this year will represent the next phase of growth and development for the region’s F&B industry,” said Joanne Cook, Managing Director, SIAL Middle East. “With the full support of ADFCA and the leaders of the nation, SIAL Middle East is committed to further developing a sustainable and innovative food sector in the emirate, and annual events like ours are part of a commitment to supporting the industry at all levels and across all facets of operation and product development,” she added. New additions to the exhibition will also include the Alen Thong Golden Coffee Pot Young Chefs Challenge. Part of the La Cuisine culinary showcase, which attracted more than 650 competing chefs in 2015, the challenge has been launched in memory of one of the Emirates Culinary Guild’s founding fathers, and will give teams of young local chefs an opportunity to share their gastronomic talents in a live competition environment. Returning for the second year running will be the Abu Dhabi Food Security Round Table series, organised in partnership with Food Security Center – Abu Dhabi (FSCAD), at which top government officials, CEOs and industry experts will discuss and debate ways of ensuring the availability of affordable, sustainable and nutritious food for the region. Another popular annual feature, the SIAL Innovation Area, showcases the world’s most innovative products, providing a unique opportunity for attendees to learn about upcoming sector trends, as well as playing host to the SIAL Innovation World Champions from around the world. Also returning for 2016 will be the World Tour exhibit, with displays by top food journalists from around the world highlighting the latest food trends and related statistics; and the hotly contested Regional Barista & Latte Art Championships. The 35th edition of The Mercurys, the most prestigious award in travel catering, will take place suing SIAL on the 5th December. These sought after accolades will cover the best airline meals, service concept, food products, beverage and equipment all being hotly contested by leaders in this industry. The event is organised in cooperation with Abu Dhabi Food Control Authority, and supported by Abu Dhabi Chamber as Host sponsor, Emirates Business Group and Al Rawabi as Silver Sponsors, Lulu as Retail Partner, Etihad Airways as Official Airline; Emirates Culinary Guild and World Association of Chefs, as Culinary Partners. The Abu Dhabi Food Control Authority was established in 2005 as an independent food regulatory agency for the emirate of Abu Dhabi. The Authority embodies the Abu Dhabi Government’s commitment to protecting its consumers, particularly by ensuring the safety and quality of food served throughout the public. It enforces policies and standards and conducts research and awareness campaigns to maintain a sustainable agriculture and food sector that delivers safe food to the public, protects the health of animals and plants, and adheres to sound environmental practices. SIAL Middle East is part of SIAL Group, the world’s largest network of professional B2B food exhibitions, which include SIAL Paris, SIAL China, SIAL Canada, SIAL Brazil, SIAL ASEAN Manila and SIAL InterFOOD Jakarta.